I don't really care about Ten Commandments monuments, or plaques, or even little framed paper printouts or whatever on government property. I mean, I think they're clear violations of the First Amendment, depressing aftertastes of the Red Scare era adopted by trolling evangelicals as part of an entire campaign to promote a false vision of American history and our supposed founding ideals, and I'm glad the ACLU fights them. But all that aside, a Ten Commandments monument outside the Oklahoma statehouse isn't a hill I plan on dying on, not when there are more important battles to fight, like the expansion of Medicare to all Americans and the forced collectivization of major league sports teams. 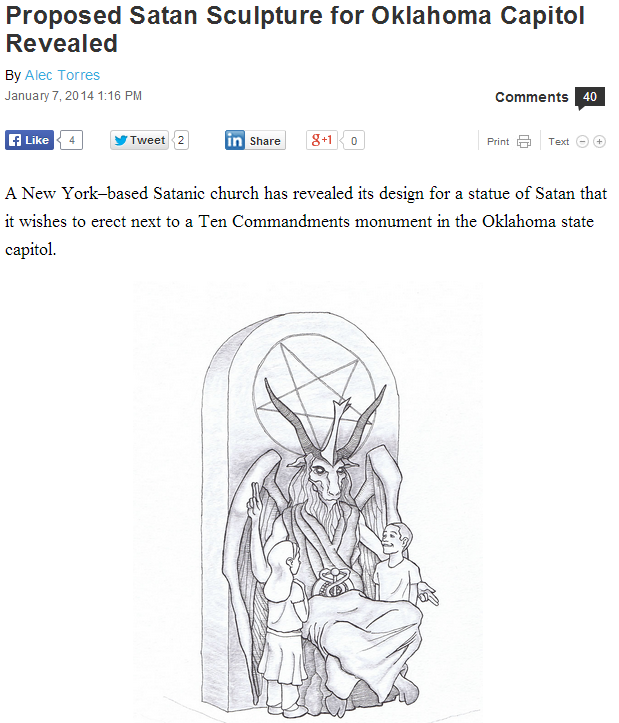 But while I will not protest too loudly about your Ten Commandments tribute, I will definitely loudly support the erection of this amazing statue to Satan, which some Satanists would like to put up outside the Oklahoma state Capitol, site of a Ten Commandments monument since 2012. Here's Satan -- or, more accurately, Baphomet the Sabbatic Goat, an occult symbol since the 19th century, adopted by Crowleyans and then LaVeyan Satanists in the 20th -- relaxing on his throne with a couple of adorable tykes by his side. It's also interactive! The Supreme Court's current take on sectarian religious monuments in public spaces is basically incoherent (they are OK if they are "historical," maybe less OK if they are not, with certain exceptions) but if one privately funded religious monument is OK, another ought to be as well. This is a similar tack to that taken by the people behind Florida's famous beer-can Festivus pole, a protest elevated from similar ones thanks to its choice of materials. (PBR cans, though Natty Ice or something would've been even better.) Florida had to allow that display to justify the Christmas decorations they were very attached to. If the right is going to continue to attempt to subvert the Establishment Clause in the hopes of eventually getting the Supreme Court to decide that it means its opposite, we may as well also use the opportunity to spread the gospel of Satan. So far, though, Oklahoma is being less accommodating than Florida. Oklahoma Rep. Earl Sears told the AP, "I do not see Satanism as a religion, and they have no place at the state Capitol." Not very Christ-like of you, Rep. Sears! I mean, yes, we can all agree that trying to build a statue of Satan at the Oklahoma state Capitol is childish, but it is also pretty good protest because there really aren't any good arguments against it once you have accepted that this "privately funded" Ten Commandments monument is kosher. Plus, Satan is way cooler than the atheist Internet "spaghetti monster" joke. You can help the Satanic Temple fund its monument at its website, where it also sells some attractive mugs and bumper stickers. Hail Satan.